Zucchini noodles tossed in pesto and topped with Italian seasoned shrimp and tomatoes. Heat 2 teaspoons of olive oil in a large pan over medium-high heat. Add the shrimp and sprinkle with Italian seasoning and salt and pepper to taste. Cook for 2-3 minutes or until shrimp is pink and opaque. Remove the shrimp from the pan and put on a plate. Cover to keep warm. Wipe out the pan with a paper towel. Heat remaining teaspoon of olive oil over medium-high heat. Add the zucchini noodles and season to taste with salt and pepper. Cook, stirring occasionally, for 3-4 minutes or until zucchini noodles are just tender. Stir in pesto. 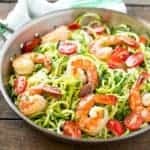 Place the shrimp on top of the zucchini noodles, along with the cherry tomatoes. Sprinkle with parmesan and serve immediately. You can get store-bought Pesto or make your own. For a Homemade Pesto Recipe Click HERE.